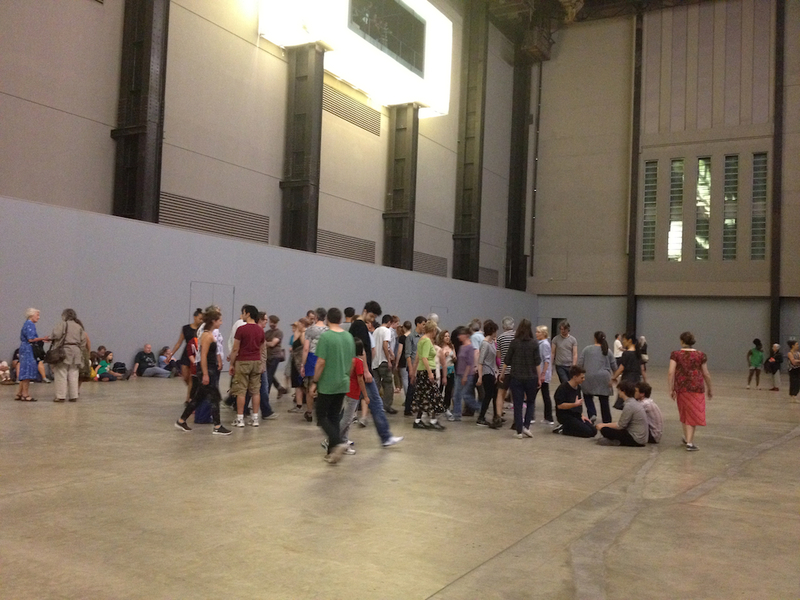 From the start, the Turbine Hall at Tate Modern has been unusual. Taking its name from the function of the vast space when the building was still a power station, it’s really not a typical museum space. The artists commissioned to make work for it have all responded to it in very different ways but it’s the response of the audience, almost as much as the work itself, that makes the annual Unilever Commission fascinating. 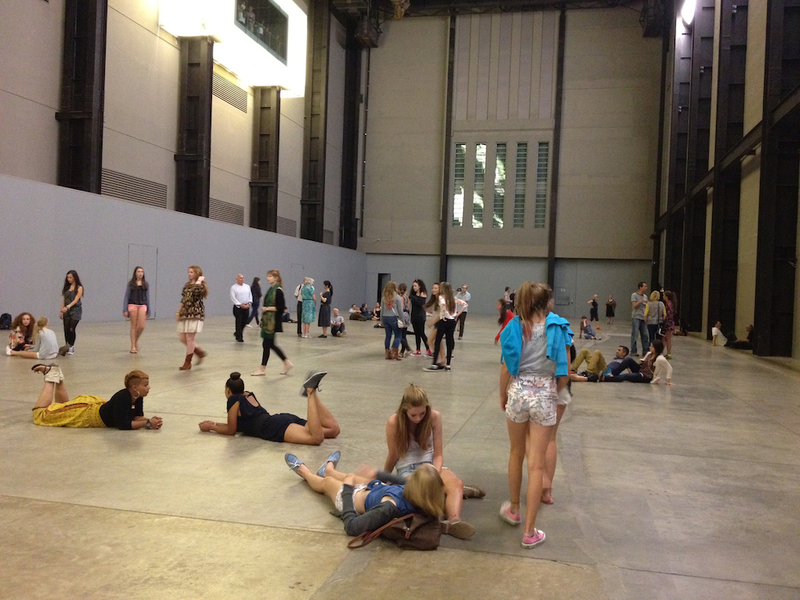 From Olafur Eliasson’s The Weather Project (which I’ve written about before) to those brief few days when visitors to Ai Weiwei’s Sunflower Seeds were allowed the access the artist had intended before health and safety concerns caused the work to be cordoned off, the Turbine Hall somehow makes people behave more like they would at the beach than in an art museum. All of which makes Tino Sehgal (whose work I’ve touched upon before elsewhere) an intriguing choice for this year’s commission. How would an artist whose work lies in the dynamic between audience and performer make work for such a cavernous space? And how would the audience respond? Seghal’s work, These Associations, leaves the space empty but for the participants and audience. The work lies in the association between the two. In a way, Sehgal leaves himself open to the accusation that this is the emperor’s new art – possibly here more than in other works of his that I’ve experienced – and it is perhaps worth considering whether we are seeing art where it is not. 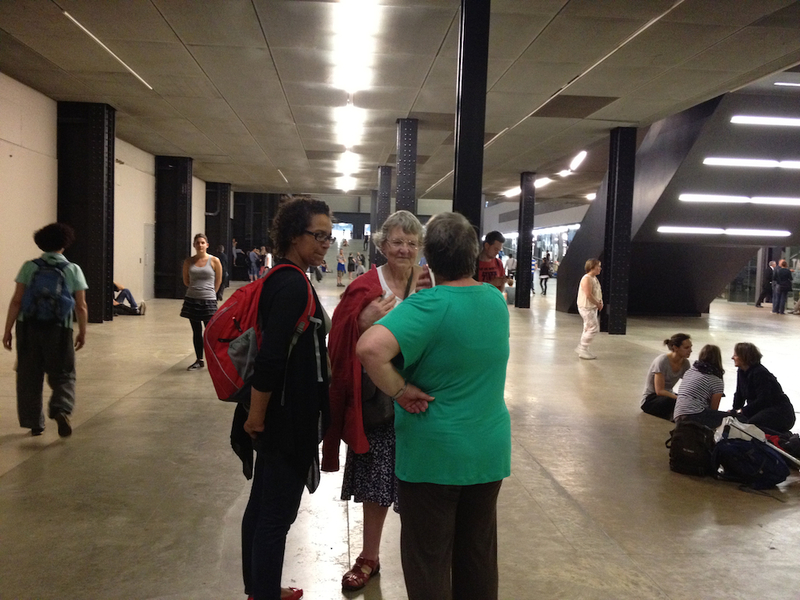 The basis of the work is that the Turbine Hall is inhabited by participants recruited by Sehgal to become the installation. The participants mill about, sometimes acting as a kind of swarm, sometimes advancing slowly though the space in an unruly row, occasionally breaking from other activities to chant the word ‘electric’ repeatedly in unison as the power dies away and is restored in the space. Mostly though, they approach visitors and start to talk. When I arrived at Tate Modern, there were quite a few people around and knowing a little about the work in advance meant I was immediately trying to work out who was who. I spotted two of the work’s participants immediately, though I’m still not quite sure what made them stand out form the crowd. Others revealed themselves more gradually whether or not they came up to me to talk. I heard a number of stories, in all cases these became conversations, about place, about personalities and relationships and how they seem from the outside, about memorable experiences. Though each participant has something they choose to start with, the essence of the work is dialogue and as such it’s not something that can be controlled in any real sense. Conversations go off topic; that’s a given. It’s fundamental to human interaction. And of course, given the nature of the interactions and of the periodic movements of the participants within the space, it’s possible for the boundaries between work and audience to break down still further. Certainly whenever the participants moved as a group, children ran around with them and the pattern of movement of the group is altered others in the space. Ultimately it becomes pretty easy to tell who’s visiting and who’s paid to be there; sure, there are other clues, but it’s pretty easy to spot the signs with trainers and no bag as the major signifiers. Given that Londoners have a reputation as being unfriendly – unfairly in my view – and given the in-flux of Olympic visitors this summer, the timing of Sehgal’s work couldn’t be better. There’s something curiously pleasing about the idea that visitors to Tate Modern this summer are likely to find themselves approached by a stranger talking about, for instance, where they grew up, but who might at any moment rush away to chant as darkness falls in the space or walk with others in slow formation, like a wall of zombies descending the entrance ramp. And is it art? Well, for what it’s worth, in my view it is; the art lies in the interactions, in the experience of being there, giving oneself up to the event and seeing what happens. But in the end, I’m not sure the question is necessarily all that useful. Art or not, it’s an engaging, fascinating and, above all, human, experience that will be unique to each visitor and change with each visit. It can be interesting and it can be confusing but, in this context at least, a bit of confusion is no bad thing. 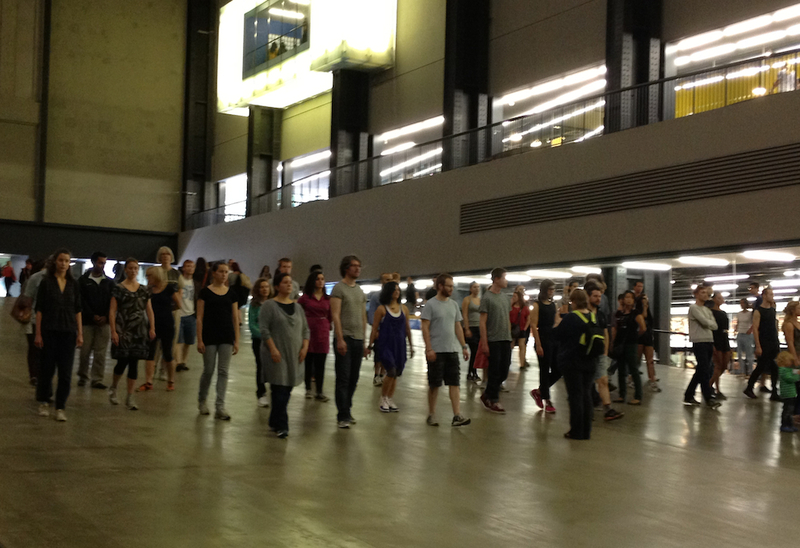 The Unilever Series: Tino Sehgal is in the Turbine Hall of Tate Modern until 28 October 2012. 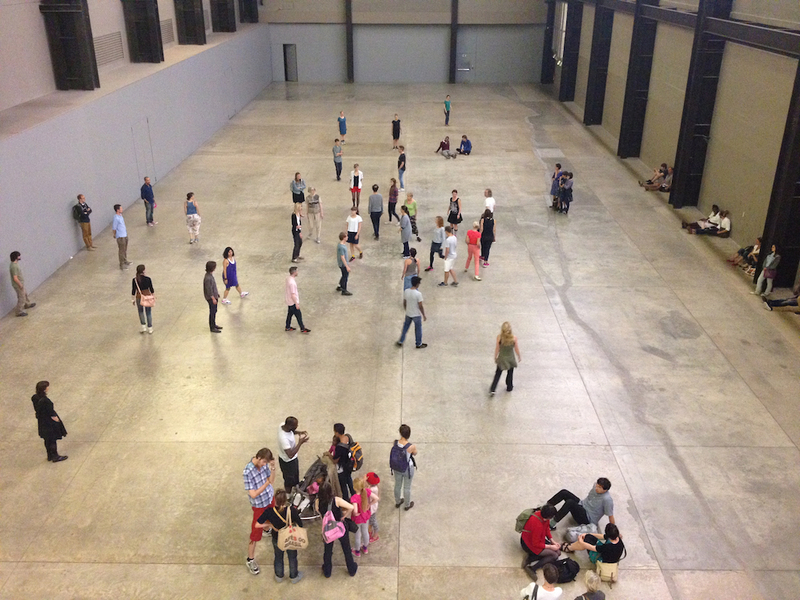 This entry was posted in Installation, Performance and tagged art, installation, performance, stories, Tate Modern, These Associations, Tino Sehgal, Tino Sehgal: These Associations, Turbine Hall, Unilever Commission by Ann Jones. Bookmark the permalink. i feel like this years commission had far less coverage than usual. apparently sehgal opposes documenting the work? incidentally, this will be the last unilever sponsored commission and the hall will be shut in 2013 for construction. Yes, the only press images of These Associations are of Sehgal and the work’s participants outside the Tate. This is the first Sehgal work I’ve been to where photography has been allowed. I wondered whether it would be forbidden but I suspect enforcing a no photography policy in the Turbine Hall would have really disrupted the piece. Didn’t know this was the last Unilever Commission, that’s interesting; twelve years is a long time to hold on to one sponsor I suppose. And I think there’ll be a lot of disruption over the next couple of years as they build the extension.